Monk and the Lamp | Will It Be OK? Monk bought a new (old) house, and there was a light fixture that was slightly off-center in one of the rooms. He noticed this, and it bothered him. Now — maybe that’s accurate and OK. People with OCD do tend to be detail-oriented, and perhaps notice small things that others wouldn’t. However… if this were the extent of OCD, everyone would want to have it, and it wouldn’t be a disorder, it would just be this really cool thing, like being smart or super-athletic. Now, keep in mind, I do like the show, and it can at times be very accurate. But what I worry about sometimes are people’s perceptions of OCD, especially based on what they see in media. And what’s sometimes not conveyed is that someone with OCD is not only likely to notice things that actually are off-center, but someone with OCD is even more likely to think something is off-center when it is not, and no matter how much it’s moved they will still feel that it’s off-center. For example, when I’m cooking… I find myself constantly worrying that the pot/pan I’m working with is not perfectly centered on the burner. So I move it a little… but then it seems too far the other way. So I move it. Over, and over… until finally I realize that no matter how much I move it, it always seems off-center, so I should just give up. Sometimes I also walk around the stove, visually assessing the situation from different angles. You can imagine how difficult this makes cooking. It’s even worse if I’m in the kitchen when someone else is cooking — if I didn’t place the pot there myself, somehow, it seems ten times more off-center just because of that. Anyway… that’s my opinion on one particular part of one particular episode of Monk that bothered me not because it was wrong but perhaps slightly misleading for some people. This entry was tagged monk, ocd, symmetry. It’s silly because someone with OCD is just as likely to not want to lift a finger cleaning someone else’s house because of the germs other people might carry. And I’m sure they wouldn’t really be happy when the person with OCD started taking hours alphabetizing everything, cleaning things that had already been cleaned, or repeatedly stopping in the middle of cleaning to “center” something on the table… ugh. I completely agree. The perception around OCD is that it’s awesome, or at least trendy, to have. I’m sure I’m hypersensitive when people say, “I’m so OCD. I don’t like my shoes being dirty at all!” It’s as if OCD has become a one-size-fits-all kind of declaration for pet peeves. I’ve only seen Monk a couple of times, and didn’t really care for it because it shows the comical side of the disorder. It doesn’t, from my limited exposure to it, at all encompass the misery that I, or those in my OCD support group, experience. Thank you, and thanks for your comment! I totally agree with what you said about the one-size-fits-all declaration for pet peeves — that seems to be how OCD is used most of the time. You hit the nail on the head with that description. And, it could be true that even “normal” people have slight inclinations of OCD from time to time. Still, it’s not right to throw it around so casually — and if they knew what OCD truly was, they wouldn’t. As for Monk — I do like the show, I feel that it’s not always realistic, but at times it portrays OCD very well. At times it also does NOT! 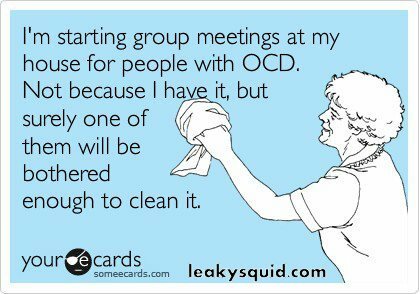 They do over-do the comical side of OCD, and have it “laughed” at frequently, and sometimes I laugh along with it. I try to laugh at myself, too. There are some dark moments on Monk, especially in the last episode, but they sometimes have little to do with the OCD part. I thought the movie The Aviator about Howard Hughes was better than Monk because while it is somewhat comical, it portrays the serious side much more accurately.